CWCTU gives thanks to you all, who are paying attentions to us and encourage us. We apologize that we are reporting about our activities of May and June together due to our busy schedule. 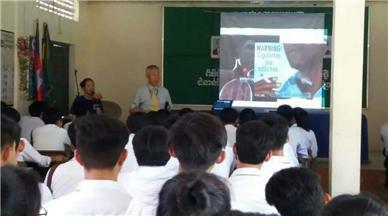 On May 30 (Tuesday), 14:00, CWCTU visited Zaungre Middle and High School, giving our temperance lecture to 100 students there of 10th and 11th grade. As usual, Dr. Yong Kang Yang, Ph.D. in Pharmacy from the U.S.A., gave the lecture, while the evangelist Makara served as interpreter. On the same day, from 10:00 a.m. at Bethany Hall at Phnomphen Korean Church, we had an intercessory prayer meeting, led by the Vice President of CWCTU, Ms. Hyang Sun Kim. From 11:30 a.m., we had our regular monthly meeting. The treasurer of CWCTU, Missionary Ms. Kwang Sook Lee preached her sermon. 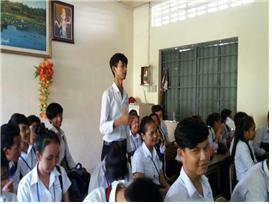 On June 20 (Tuesday), at 14:00, CWCTU had a temperance lecture for the 94 students at 10th grade at Zebba Umbbuheuh Middle and High School. Then from 15:00, we had 96 students from grade 11, at the auditorium. Though we repeated the same temperance lecture twice on the same day, White Ribbon sisters of the CWCTU all were very happy at the event as well as Dr. Yong Kang Yang. The principal of the school who attended the temperance seminar, was greatly impressed by the lecture and asked us to come again next semester. We, CWCTU members were overwhelmed to see him appreciate our efforts. It is because we have been so used to seeing principals of many other high schools, who responded to our temperance lecture, rather unwillingly, though they had to hold it due to the public letter of requests, we carried. In the midst of a hot summer, we pray for you, who support the temperance work in Cambodia to have health and peace. Now it is time of summer vacation which lasts for two or three months. Since the schools will have vacation, we are seeking to be near to the Lord, in each of our places, and share with one another.